Ivy Book Bindings: Mini Reviews: Endlessly, Wander Dust & Across the Universe! Mini Reviews: Endlessly, Wander Dust & Across the Universe! Evie's paranormal past keeps coming back to haunt her. A new director at the International Paranormal Containment Agency wants to drag her back to headquarters. The Dark Faerie Queen is torturing humans in her poisonous realm. And supernatural creatures keep insisting that Evie is the only one who can save them from a mysterious, perilous fate. The clock is ticking on the entire paranormal world. And its fate rests solely in Evie's hands. So much for normal. Endlessly was a wonderful conclusion to White’s debut series. While I didn’t enjoy it nearly as much as I loved Paranormalcy, it was much better than Supernaturally was and is the type of ending that leaves the reader wholly satisfied. I loved how plot lines from both the previous novels intertwined and came together in this stunning conclusion, forcing Evie to own up to her powers and use them once and for all. I think what strikes me the most about this series, either than its quirky narration, is the romance. It’s not like most trilogies where a love triangle is prevalent and one team walks away grinning while the other team cries their eyes out after the third novel. Instead, Evie and Lend have been together ever since they fell in love in Paranormalcy and their relationship, while tinged with paranormal elements and disasters for sure, is also filled with normalcy. Furthermore, their love story grows throughout each novel and progresses through real conversation which I adore. It is evident, especially in this novel, that Evie and Lend accept each other for who they are and don’t expect one another to change. It’s a sweet and unique romance which is one of the primary reasons I love this series so much. Ever since her sixteenth birthday, strange things keep happening to Seraphina Parrish. The Lady in Black… burns Sera’s memories. Unexplainable Premonitions… catapult her to other cities. The Grungy Gang… wants to kill her. And a beautiful, mysterious boy… stalks her. But when Sera moves to Chicago, and her aunt reveals their family connection to a centuries old, secret society, she is immediately thrust into an unbelievable fantasy world, leading her on a quest to unravel the mysteries that plague her. In the end, their meanings crash into an epic struggle of loyalty and betrayal, and she’ll be forced to choose between the boy who has stolen her heart and the thing she desires most. Wander Dust is the breathtaking fantasy that will catapult you through a story of time, adventure, and love. Wander Dust is a novel that not too many people know of and now I can see why. I think my issues with this book stemmed, not from the book, but from myself. I have read more than my fair share of novels with protagonists performing strange/paranormal acts and then learning that they have magical powers, so I was extremely bored for the first third of this story when Seraphina Parrish goes back and forth in time and fails to realize that she is a time traveler. Seraphina’s apparent stupidity aside, I just didn’t feel anything for her. This is a character who lost her mother at a young age and whose father is rude, mean, and virtually doesn’t care for her, but I still didn’t care about Seraphina. Somehow, the author failed to make me have that connection with her which I craved and if I don’t feel connected to a character within the first-half of a novel, the chances are slim that we’re really going to connect during the second-half. Nevertheless, I think Wander Dust has potential and I might have moderately liked it or given it at least 2.5 or 3 Stars if I had finished it through. Its ideas are nothing original and its execution is bland, but non-prolific paranormal/fantasy readers would definitely find something to love within these pages, as would middle-grade readers. For me, however, this book was not. I am sorry to say that I was extremely unimpressed by this novel. I read a little over half of it and found myself to be skimming it quite a bit when I realized that perhaps Across the Universe just wasn’t a novel for me. In fact, I think the best aspect of this book is its cover. Once you begin reading though, the characters of Amy and Elder are flat and lacking, the pace is slow and it takes the reader over a hundred pages to reach the dilemma hinted at in the synopsis, and the romance is your usual insta-love. In other words, while this novel may be set in space, it has absolutely nothing new to bring to the table. I have to admit that I enjoyed the science fiction elements of this tale and find the concept extremely fascinating, but beyond that, the execution of this story fails to do justice to its ideas. Amy is, for the most part, asleep and her narration is unnecessary until she wakes up. Yet, we are given descriptions of her nightmares which play absolutely no role in the plot or development of Amy’s character. Elder, on the other hand, is quite irritating and falls in love with Amy because of her red hair, not to mention other lustful qualities about her appearance. I didn’t feel anything for these characters and can only question why this novel has been given so much hype. If that wasn’t enough, the mystery element to this plot line is dull, lacking, and utterly predictable. I hate it when authors write as if their readers are stupid or don’t read between the lines, because we do! I can count on one hand the number of books whose plots I haven’t guessed this year and unfortunately, Across the Universe is not one of them. I’ve heard phenomenal things about this book and I am sure that this novel does merit the hype it gets; if, that is, you’re interested in a typical YA story which lacks character development, contains a huge dose of insta-love, and has a predictable plot line. Or, if those elements don’t bother you, you’ll like this. I, on the other hand, am dying for something original, creative, and new which I just didn’t find in this novel. I agree with you about Across the Universe, I struggled so hard to even finish it. It's just not my thing. and I'm not interested in reading Endlessly at all, after the second book, I decided I won't even bother. 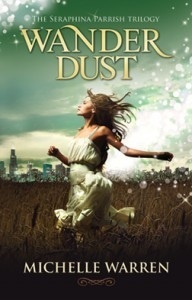 Wander Dust, however, is a book I really and truly loved. I see where you're coming from, and I even agree with you. It's filled with same old tropes, but it worked for me. Phew! It wasn't just me then, thankfully! I wasn't too interested in Endlessly either, but I went with it and it was cute and a nice time-pass, so if you're looking for that then maybe you should check it out. Aww, I really hope I like Across the Universe more than you did because I have a copy, ha! Also, I really want to read more sci fi/space books like Glow/Spark by Amy Kathleen, so I was hoping this would fill that gap! I'm not sure why, but the Paranormalcy books have never impressed me much. I sort of enjoyed the first two, but have never really felt any sort of enthusiasm for the final one. I probably won't read it. It's a shame Wanderdust was a DNF for you. I've heard good things about that book so I'm sorry it didn't work. :( Thanks for the helpful reviews, Keertana! I liked the first Paranormalcy book, barely scraped through the second. The third...much better than the second. But there's something I can't put my finger on- I just don't feel at all like reading it. Across the Universe...I actually bought this book. And I just have never got beyond the first couple of chapters. Have you tried the second book yet? I know what you mean - Supernaturally was so tough to get through! I think the series is cute, but just forgettable so there's not too much of a point to reading them unless you want to for pure enjoyment, which I did and liked. I understand why you wouldn't want to continue though. Can I just start out by saying I love the fact that your mini reviews are the length of my normal reviews? And sometimes longer:) I'm really glad to see you enjoyed Endlessly, I've heard Supernaturally doesn't really impress as much as Paranormalcy did, and I'm excited that the trilogy ends on a higher note:) Thanks for your thoughts Keertana, you always give such a thorough review! I just read ACROSS THE UNIVERSE this week and I agree with your review/rating completely. I'm sorry to see you had mixed feelings about the other books, too--I like your mini review format for these, and it's something I keep meaning to do at some point for all those books that I don't feel all that strongly about one way or another. Hope your next reads are better!! The Paranormalcy series sounds so fun and I LOVE the fact that the relationship seems so normal in the world of...paranormal. I think I am just quoting the series title at this point. I agree with you on Across the Universe. I sort of liked it but upon thinking about it more, I didn't really. The twist was SO underwhelming and predictable. It's such a cool premise that fell flat for me. I know right? I love their relationship and its originality so much, so that really makes the series stand out for me. I'm glad to see I wasn't the only one who didn't enjoy Across the Universe, so it's good to know I'm not alone. Have you read Glow or Spark yet? It's also set in space, so I'm planning to check those out next...hopefully I'll enjoy them more! Oh, I love your mini reviews. Nicely done! :D I'm sorry to hear that you didn't like Across the Universe. 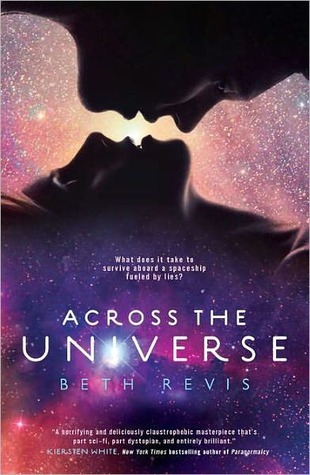 Great review - totally agree about Across the Universe - I don't understand the hype it gets. Flat characters and a flat story and mediocre writing... Beautiful cover, though!